Love cherries? White chocolate? Both? 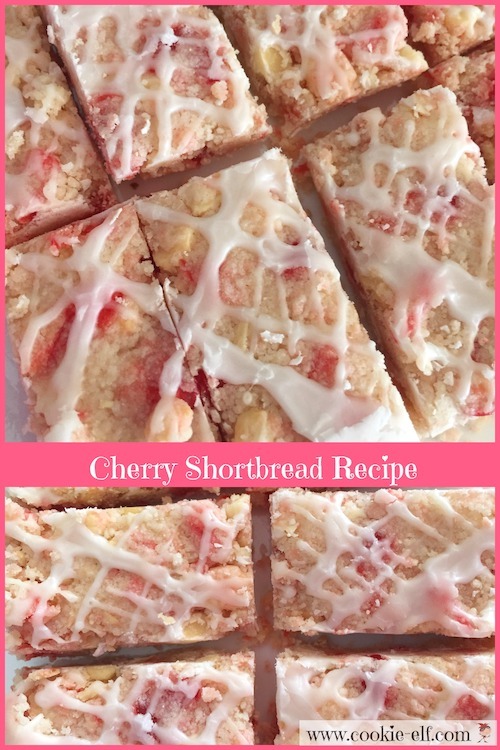 This Cherry Shortbread Recipe is a lovely, colorful variation of the rich, buttery classic bars with your favorite flavors. And it’s so easy to make! Maraschino cherries are bright red, flavored with sweetener and almond flavoring, and processed in sugar syrup. The trick to using them in this recipe is to chop them finely and then set them in a colander to drain while you mix the cookie dough. This prevents runny or lumpy shortbread and distributes the flavors through the bars. Preheat oven to 325º F. Line a 13 x 9 baking pan with aluminum foil or parchment paper. Reduce speed to low. Add almond extract. Beat until combined. Gradually stir flour into creamed mixture a bit at a time until well blended, scraping the bowl constantly, until well mixed. Dough will be crumbly. With floured fingertips, press dough into the prepared 13 x 9 baking pan. Bake shortbread 20-25 minutes just until the edges begin to brown. Remove baking pan from the oven. Use a sharp knife to cut shortbread immediately. Score thin bars, ½ inch by 1 inch (or whatever size you choose.) Let shortbread cool completely in the pan. While shortbread cools, whisk together the glaze. Use a spoon to combine powdered sugar, almond extract and 1-2 teaspoons milk or water. Add additional milk or water 1 teaspoon at a time to get the right consistency. Drizzle glaze over cooled bars. To remove bars from the pan, lift ends of parchment paper. Recut through scores if necessary. You can cut shortbread in ½ - 1 inch wide strips the length of the pan and then 1 -1 ½ inch bars widthwise. Glaze is the best when it drips in a steady stream from the spoon, rather than with a sluggish or runny consistency. See more shortbread variations on our Pinterest board.